"Statistics are the only real voice Puerto Ricans have." 64. That was the official death count shortly after Hurricane Maria struck, devastating Puerto Rico just over six months ago. But demographer Alexis Raul Santos found evidence for hundreds more that officials had missed. To be exact, 1,085 more deaths. That they didn’t count. And that’s just from September and October alone. That’s a huge oversight that’s not only disrespectful to Puerto Ricans — it slow recovery from future events even worse by inhibiting governments and engineers from planning for them, according to a new study. Let’s go back to what happened with the death count numbers. It seems as though officials counted only people who died directly as a result of the high winds and immediate destruction caused by the storm, according to the New York Times. And while that might have indicated to Trump that his administration had handled the disaster well, it didn’t hold up to further assessment. In a previous study, Santos, the director of the graduate program in applied demography at Penn State University, and his team looked at the relative amount of deaths in post-storm 2017 as compared to previous years. found a 45 percent rise in deaths that occurred in nursing homes compared to 2016, and a similar 41 percent rise in emergency room deaths. The researchers also examined specific causes of death, noting a 47 percent rise in sepsis-related deaths in September 2017 compared to September 2016. That was the subject of Santos’ most recent study, published Monday in the journal Health Affairs. 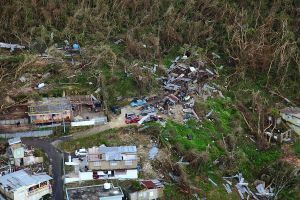 In it, Santos argued that statistics may be the best weapon for residents of the island, especially when facing the federal government’s slow and inadequate disaster relief effort. Underestimating the damage and death toll caused by a storm like Maria will not only reduce the relief response — the amount of resources, the number of people shipped out to help — but it will also mean that people might not adequately prepare for future storms. “There are a lot of things that can go wrong if you aren’t carefully gathering and analyzing data, particularly in your ability to convey the devastation of, in this case, an environmental disaster,” said Santos. He believes that underreporting damage caused by a storm may cause those who are in a position to help, such as politicians and other officials, to lose interest. That kind of information is especially important when you consider that Puerto Rico doesn’t have the easiest time getting interest from those in power in the first place. Because Puerto Rico is a territory, its residents have fewer rights than Americans that live in the 50 states, like not being able to vote in presidential elections. Santo hopes that his efforts to collect and improve data that reveal the reality of life on the island will speak for itself, giving the citizens who are still affected by Hurricane Maria (yes, still) the political power they may otherwise lack.